Many experienced artists paint primarily on canvas. Canvas is a suitable surface for painting. Strong and durable canvas absorbs acrylic paint well. Acrylic paint works for beginning painters. Acrylic paint dries quickly, allowing you to paint over your first coat. If you don't like a design you're painting, simply paint over it using a darker color. Don't add too many coats of acrylic paint. Thick layers of acrylic paint can crack. Pour acrylic paint into a palette. Pour three to five colors into two separate palette grooves. At least two of these colors belong to your seashells. At least one of the colors belongs to the background. For the most realistic seashells, use light colors like white, beige and yellow. For the most contrasting background, use vibrant colors like sky blue or purple. Apply the background paint to the canvas using a medium sized paintbrush. Brush from top to bottom. If you wish to paint a complicated background instead of a simple color, use your paintbrushes to fill in the background with other shapes, colors and objects. Allow each color to dry for about 15 minutes before painting over it. Dip a medium-sized paintbrush in the lightest seashell color. Outline the shape of a seashell with this paint. 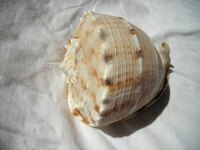 Most seashells are round or oval. For extra guidance, place a seashell on a table in front of you. If you can't locate a seashell, use a photograph of a seashell instead. Fill in the outline of your seashell with the lightest color paint. Allow this layer of paint to dry for about 15 minutes. If you can still see any of the background color underneath the seashell, apply a second coat of the lightest color paint. Allow this layer to dry for 15 minutes. Add details to your seashell. Dip a small paintbrush in the medium-colored seashell paint. If possible, use your seashell or the photograph or a seashell for reference. Paint the grooves of the seashell by painting lines on the seashell. These top to bottom lines take up the middle of the seashell, with a small space free at both the top and bottom. There should be three to six lines. Allow this layer of paint to dry. Paint highlights and shadows, if desired. Dip a clean paintbrush in the darkest color of paint. Paint over the edge of the seashell on one side to create a “shadow.” The shadow should be on the side, opposite the light source in the painting. If you don't have a designated light source, paint the shadow on the bottom right.